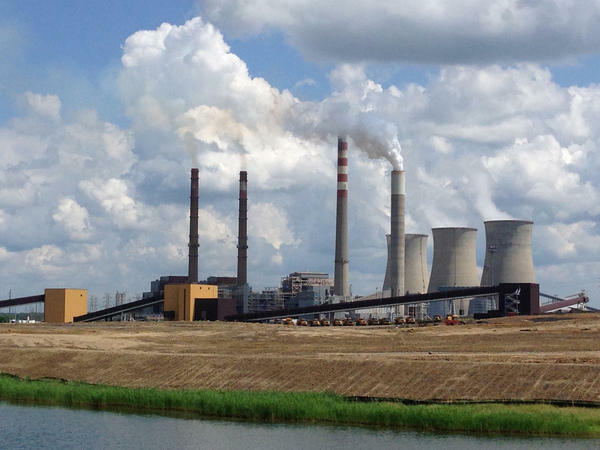 President Trump is pressuring the Tennessee Valley Authority not to close a coal-fired power plant at its Paradise Fossil Plant in Kentucky. In his latest effort to boost the coal business — and in the process help a major supporter — President Trump has called on the Tennessee Valley Authority to, essentially, ignore the advice of its staff and keep a large coal-fired power plant operating. The move has drawn extra scrutiny because that plant buys coal from a company headed by a large campaign donor to Trump, Murray Energy Corp. Chairman, President and CEO Robert Murray. The facility at issue is the last remaining unit at TVA's Paradise Fossil Plant in western Kentucky. In an environmental assessment signed Monday. TVA staff proposed retiring the coal-fired plant. The report says, "As a large coal unit with medium operating costs and a high forced outage rate, as well as the need for significant repairs, PAF Unit 3 does not fit current and likely future portfolio needs." The staff also has proposed closing another coal power plant in eastern Tennessee called the Bull Run Fossil Plant. This continues a trend at the TVA of shuttering coal plants in favor of other sources for generating electricity, including natural gas and renewable energy. The move has helped attract companies like Google that build large data centers and want to power them with cleaner sources of energy. Despite that, President Trump said on Twitter Monday evening, "Coal is an important part of our electricity generation mix and @TVAnews should give serious consideration to all factors before voting to close viable power plants, like Paradise #3 in Kentucky!" Senate Majority Leader Mitch McConnell of Kentucky and Energy Secretary Rick Perry also took to Twitter to echo the president's message. The agency responded on Twitter, "Mr. President, coal is an important part of TVA's power generation mix and we will give serious consideration to all factors as we make this decision." Four of the nine members of TVA's board of directors were appointed by Trump. Two other posts are currently unfilled. The board could vote on whether to close the plants at its quarterly business meeting Thursday in Chattanooga, or the agency could choose to delay the decision. First the board will hold a public hearing on Wednesday, at which environmental groups say they will show up in force to ask the board to close down the coal plant. "Coal is a bad choice for the people of the Tennessee Valley. Not only because it's uneconomical but because it's a dirty way to generate energy," says Jonathan Levenshus with the Sierra Club's Beyond Coal campaign. In an emailed statement, Murray Energy Corp. reached the opposite conclusion of TVA staff and said, "In the interest of the TVA ratepayers, the remaining coal-fired unit at the Paradise Plant must remain in operation. The power will be more reliable and lower cost." Despite concerns about coal's significant contributions to climate change, President Trump has made his support for the coal business a key point during his election campaign and presidency. Last year Trump ordered Perry to take steps to help struggling coal and nuclear power plants, which have trouble competing against cheaper natural gas and renewable energy. No such plan has been carried out so far. Meanwhile, coal plants have continued to close during Trump's time in office, and coal consumption in the U.S. has hit its lowest point in nearly four decades.